BSP thread sizes are mentioned throughout our site as these are standard thread sizes used throughout the sanitary industry. This term stands for 'British Standard Pipe' although it is used as an international measure throughout the world. If you have a fitting and you're not sure what size it is, this simple guide should help. 3/8", 1/2", 3/4", 1", 1.25" & 1.5"
As an example, if you have a 1/2" quarter turn ceramic disk tap valve, the 1/2" refers to the thread on the cartridge that screws into your tap - it is this thread that will measure approx. 20.9mm across. For further reading, we recommend the Wikepedia page. 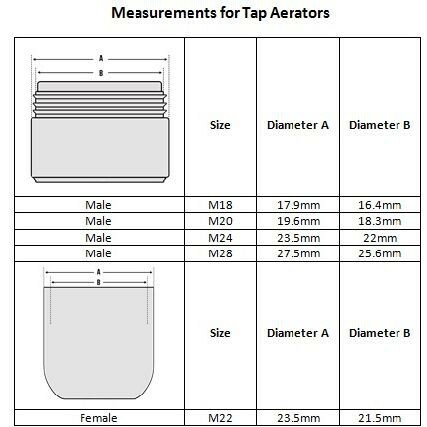 To work out which aerator or nozzle you need, compare yours to the table below to determine the correct size (sizes are approximate to be used as a guide.